De Fontenay begins, however, with a brief analysis of Jacques Derrida’s work on “the animal,” which she describes as “both parallel and asymptotic” with her own (2). Thus safely distancing herself from accusations of epigonality, de Fontenay then offers a fine, if rather sedate reading, one that only really comes alive when exploring the insistent motifs of time and sacrifice in Derrida’s oeuvre. Here, de Fontenay makes a number of important points, in particular as regards to the tendency of Derrida’s notion of sacrifice to oscillate between the historical and the metahistorical (10). Furthermore, she notes that Derrida’s “limitless extension” of the sacrificial domain risks falling into the trap of a vulgar evolutionism, one which would ultimately posit Christianity as the “spiritual and social accomplishment of history” (15). To combat this, she argues, any rigorous engagement with the notion of sacrifice must be attentive to the specifics of its emergence (15). In the two major “philosophical” chapters, de Fontenay turns her attention to the difficulties that arise once one refuses the metaphysics of human exceptionalism. The first, entitled “The Improper” is, however, a frustrating experience. Principally, this dissatisfaction stems from the fact that de Fontenay appears completely unaware of the significant number of important texts produced on just this subject over the last two decades or so – a criticism that becomes all the more pressing as the book progresses. What marks de Fontenay’s position as somewhat unusual, however, is that she clearly wants to reinstall some form of distinction that would permit human beings to maintain both absolute priority and absolute superiority. She wishes, in short, to escape the hubris of humanism, but without offending humans in the process. To this end, she writes, one cannot allow “unauthorized” incursions from other disciplines (such as zoology and ethology) to “destroy without remains the affirmation of the rupture constituted by anthropological singularity, an affirmation that only recourse to philosophical tradition can supply” (21-22). In this, continues de Fontenay, it is only prudent to propose what is a minimal, “zero degree” definition of the human that avoids excluding any section, to wit: “a human being is a being born of the natural or artificially provoked union of a woman and a man” (24). Such a definition, however, presupposes knowledge of “man” and “woman” as (gendered) human beings, and is thus clearly tautological: a human being, in other words, is a being born of human beings. Things become simply baffling, however, when, in proposing an argument for a negative anthropology, she asserts that the question “what allows us to recognize a man” is “indecent,” as “everyone knows right away ‘if this is a man’” (24). “Man,” it would seem, has replaced the Gods both of negative theology and of the most dogmatic of evangelical Churches. Even more bizarrely, after insisting that “man [sic] is a being who neither can nor must be defined” (24), de Fontenay then proceeds to reaffirm just about every definition “tradition” has thus far employed to deem “Man” an exceptional being. Hence, de Fontenay abruptly halts her summation of recent philosophies of the animal to proclaim instead that “urgency” compels her to repeat “the oft-rehashed criterion of a specifically human language” (39). Only the human, she writes, possesses declarative, ostensive, conversational and performative language – a claim regarding a difference of kind stated with all the simplicity of the self-evident. After invoking the authority of Aristotle, de Fontenay concludes that, “in the final analysis,” what animals lack “is everything related to doxa, to belief, to persuasion, adhesion, and therefore to rhetoric” (40). Here, then, having initially argued that the refusal of any definition of “man” is the only acceptable ethical and political position, de Fontenay now declares “man” to be the sole “ethico-rhetorical” being, bearing alone the exceptional privilege of “metaphorical power” (40). Only humans, in other words, converse, believe, and have representations of mental states, not to mention metaphorical language, ethics, politics, and a great deal more besides. Astonishingly, de Fontenay then adds that “we can all agree that deeming this, so close to the thought of the Sophists, what is proper to man has nothing metaphysical about it!” (40). De Fontenay then goes on to propose not one, but two further defining capacities of mankind, viz, the ability to “modify the global structure of the relations proper to the species” and the ability to give oneself “a global representation of the organizing principles of society” (41). Again, all this is stated as a simple fact. One cannot help wondering just what de Fontenay is doing here. Why, given her earlier note regarding the harmfulness of exceptionalism, is she exerting so much time, space, and effort to reinstall anthropological difference? The only answer, once again, seems to be the desire to write a book that will not offend, in this case creationists and dogmatic liberal humanists in particular. Whatever the reason, the process continues: Only humans, she then contends, are not programmed by their DNA, the unique property of epigenesis alone guaranteeing that every human child is “unique every time” (44). With this, de Fontenay thus reiterates one of the most noxious productions of the entire philosophical tradition, one that renders every other animal identical with the species as a whole and thus infinitely exchangeable. If she had perhaps read more widely in the field, however, she would have soon discovered that epigenesis – and indeed cell recapacitation – is increasingly being viewed among geneticists and biologists as characteristic of all organic living beings. Given this, it is therefore with a sense of vertigo that the chapter entitled “They Are Sleeping and We Are Watching over Them” opens with a condemnation of those who deem other animals to be “lacking in reason and in articulate word,” precisely because this “allow[s] them to be used and abused as tools, as personal property” (96-7). Without any discernible irony, de Fontenay thereafter turns with appreciation to three philosophers who, she claims, courageously refused the “separatist vulgate” in favour of human-animal continuism. The philosophers chosen, however, will probably come as something of a surprise: Aristotle, Leibniz, and Husserl. De Fontenay begins with a summary of what for Aristotle constitutes the idion of nonhuman animals: possessing only “the persistence of an impression, which nonetheless already supposes time, the animal does not have the capacity to stop and develop the reasoning that pushes it [sic] to act in the direction of the future” (101). This notion of a persistent impression immediately raises questions of iterability and of the trace, central to Derrida’s critique of metaphysical tradition and its exclusion of the animal. De Fontenay, however, concludes here only that animals, insofar as they lack the middle term necessary for syllogistic reasoning, are thus incapable of judgment and opinion. Here too, de Fontenay appears ignorant of the extensive literature – beginning with Chrysippus and including Plutarch, Porphyry, Sextus Empiricus, and Montaigne – concerning just this question of animal syllogisms. De Fontenay, however, merely uses Aristotle as a springboard to repeat, almost word for word, her earlier argument: namely, that “man” is the only “ethico-rhetorical” animal (102). Despite this, she then concludes that the “hastily established” Aristotelian human-animal distinction is nevertheless “ambiguous” (102). With this, de Fontenay turns to Leibniz. As is well known, for Leibniz anthropological difference centres upon the relationship to God, insofar as only human “minds” are “images of the divinity itself … capable of knowing the system of the universe” and thus “of entering into a kind of society with God” (Monadology §83-84). Despite this seemingly unsurpassable exceptionalism, however, de Fontenay locates a crucial conflict – one with clear implications for Aristotle’s persistence of impression – between a continuous and a discontinuous hierarchy of being within Leibniz’s conception of perception, insofar as imperceptible yet multitudinous murmurings “ensure the faultless continuity between sensibility and understanding” (103). Leibniz, explains de Fontenay, resolves this conflict by proposing an anthropogenetic movement of natural translation, which posits that certain animal souls already possess the seeds of reason within them as an aptitude that is actualized when its time is right, thus permitting both separation and continuity between humans and other animals. With this in mind, de Fontenay similarly locates a certain continuity within Husserl’s notion of “animality” as the preconstitutional realm, a continuity that conflicts dramatically with his reduction of actual animals to “blind modes of instinctual life” (cit. 109). From this brief unfolding and infolding of the three philosophies singled out here, a fascinating glimpse of possibility thus emerges on the border between Husserl’s universal animality and the rigorous Husserlian “as if” that authorizes a certain human-animal “transfer.” This transfer, writes de Fontenay, takes place by way of empathy [Einfülhung], although this latter must be understood in the specifically Husserlian sense of “an action proper to the transcendental attitude,” one which allows Husserl to give “a rigorous status to the ‘as if’” (109). Through their various institutions of the analogous “as” and the intuitive “as if,” she continues, Aristotle, Leibniz, and Husserl potentially offer an invaluable resource against reductionisms of all kinds. Such a project would indeed be fascinating, and it is perhaps unfortunate that this book was not the result of just such a sustained philosophical exploration. 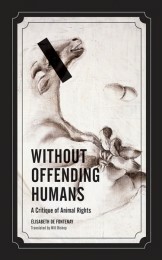 The question of philosophical rigour, or its absence, brings us finally to “Between Possessions and Persons,” the sole chapter – despite the overtly polemical translation of the book’s subtitle – purporting to offer a critique of contemporary animal rights discourse. Here, de Fontenay is clearly enraged beyond measure – and often beyond sense – by Paola Cavalieri’s Great-Apes Project, which seeks to establish a form of human rights on behalf of chimpanzees, gorillas, and orangutans. Specifically, and despite what she has written elsewhere, de Fontenay’s focus here concerns the reinscription of other animals within such “struggles for emancipation” as characterize the political domain (48). Nonetheless, she rightly cautions against a naïve and uncritical continuism, as such would be all too easily appropriated by racist discourse. It is with a suggested lack of caution, however, that de Fontenay turns to Cavalieri’s work. While once again contending that only philosophy is adequate to such task, the “barely conceivable question” of extending rights to Great Apes, she claims, emerges instead out of disciplines such as zoology and ethology (52). Why this question should be “barely conceivable” is not explained. Instead, the very different question of philosophical rigour – and, with that, the question of academic responsibility – imposes itself. Cavalieri’s “claims” are dubbed “outrageous,” an adjective subsequently extended to the utilitarian theory of Peter Singer as a whole. Singer, writes de Fontenay, proposes “a truly extremist hypothesis” (53). This, she continues, is because, and in direct contrast to animal rights’ theorists such as Tom Regan, Singer views the “vocabulary of rights” as simply “a convenient political shorthand” (53). Singer, of course, has always been very clear on this score (a position, moreover, which is hardly “extremist”), and as such it begs the question as to why de Fontenay thereafter sets up Singer, and not Regan for example, as the representative of contemporary animal rights theory, even going so far as to reduce the entirety of animal rights discourse to what she calls the “utilitarian offensive” (63). In the most reductive manner imaginable, de Fontenay takes from Singer only the argument that, if vivisection is morally acceptable, then so too are experiments performed on mentally-handicapped humans. Singer, of course, is not advocating experimentation on humans, but rather making the point that humans have no moral right to experiment on other animals. De Fontenay, however, misreads into Singer’s “scandalous” argument little more than an apology for the crimes of Josef Mengele. Thereafter revoking Singer’s status as a philosopher by placing the term within inverted commas, de Fontenay then – and again with no sense of irony – accuses Singer of displaying an obvious “lack of civility” (56). While I consider the notion of animal rights, in both its utilitarian and neo-Kantian variants, to be inherently flawed, I nonetheless find de Fontenay’s “critique” to be at once superficial and deeply offensive to such philosophers who for so many years have committed themselves to the betterment of the lives of our nonhuman kin. Ultimately, de Fontenay’s confession of “outrage” serves only to mask a conservative timidity “justified” by recourse to vague notions of morality along with facile statements such as “[t]hat’s just the way it is and no argument is needed” (52). After accusing Singer and Cavalieri of a lack of style and a rhetoric of bad taste, de Fontenay then suggests that such methods are, in fact, excusable “to a certain extent” – given the urgency of stopping horrendous psychic and physical torture (58). This urgency, however, is insufficient to prevent de Fontenay in subsequent pages from deeming Cavalieri’s work “inappropriate,” “indecent,” misanthropic, “saddening,” and, finally, nauseating. This, she continues, is because they fail to respect the “nobility” and “dignity” of Man (59). Such a notion of “dignity” is of course hugely problematic however – as de Fontenay herself notes in her encyclopaedic masterwork Le silence des bêtes. Political theorist Carl Schmitt, for example, persuasively argues that it is nothing more than an ideological construct providing an “especially useful” instrument of imperialism (Schmitt 54). In yet another sudden swerve, de Fontenay then declares that the “institution of a rights of animals” is “one of the legitimate struggles of our time” (61). So then, does she agree with rights for animals, or not? Well, yes, on condition that such rights are “not awkwardly mimetic” and attributed as a sort of appendix, but rather that they confer an individual and international ethical codification of “moral status” (62). This, however, is all somewhat simplistic, and would ultimately result in being precisely just such an appendix. Recalling the necessity of the properly philosophical, in conclusion de Fontenay calls upon Schopenhauer, Husserl, and Merleau-Ponty to support her notion of pathocentrism based upon suffering as that which is “shared by all living beings” (67). Perhaps most problematic here is that for de Fontenay it is the possibility of an empathic human understanding alone which marks out certain animals (but not others) as being somehow worthy of concern, and thus rendering “pathocentrism” a uniquely human concern in the process. With this, one can only wonder how far de Fontenay actually strays from the narcissistic contemplation of her own reflection. Ultimately, de Fontenay is correct to criticize rights theorists for acting as if Nietzsche and Derrida never existed (64); correct in arguing for a thorough deconstruction of the notion of natural right (66); and correct too in suggesting that any discourse on rights demands a deep and nuanced understanding of the philosophical, historical and juridical problematic (66). One might add, however, that such a demand is equally applicable to any critique of rights discourse. By contrast, de Fontenay’s conclusion – that we must “find a place in international law that facilitates the existence of a community of the living … These legal reforms can only be undertaken if the meaning of pity is reevaluated” (132) – sounds both naïve and empty. Lacking depth and nuance, in the final analysis de Fontenay’s plea on behalf of a deconstructionist approach to thinking human-nonhuman relations will serve only to aggravate people against such an approach, and that is indeed a great pity. de Fontenay, Élisabeth. Le silence des bêtes: La philosophie à l’épreuve de l’animalité. Paris: Fayard, 1998. Franklin, Sarah. Dolly Mixtures: The Remaking of Genealogy. Durham & London: Duke University Press, 2007. Heller-Roazen, Daniel. The Inner Touch: Archaeology of a Sensation. Cambridge, MA & London: The MIT Press, 2007. Iveson, Richard. “Animals in Looking-Glass World: Fables of Überhumanism and Posthumanism in Heidegger and Nietzsche.” Humanimalia: a journal of human/animal interface studies 1:2 Spring 2010: 46-85. Porphyry. On Abstinence. In Select Works. Trans. Thomas Taylor. London: Thomas Rodd, 1823. Schmitt, Carl. The Concept of the Political. Trans. George Schwab. Chicago & London: The University of Chicago Press, 1996. Singer, Peter. Animal Liberation. London: Pimlico, 1995. On this, see for example Sarah Franklin Dolly Mixtures: The Remaking of Genealogy. On this, see Daniel Heller-Roazen The Inner Touch, 127-130. Porphyry’s account is particularly interesting, insofar as he invokes Aristotle to support his argument that other animals necessarily “participate of reason” (On Abstinence III: 6, 101). It should also be noted that de Fontenay’s Le silence des bêtes shows clearly her familiarity with all these writers. It should be noted that the original French title, Sans offenser le genre humain: Réflexions sur la cause animale, contains no specific reference to animal rights whatsoever. On this, see de Fontenay Le silence des bêtes, 43-47. Also Giorgio Agamben Remnants of Auschwitz: The Witness and the Archive, 68-72.